Our gourmet gluten-free dessert recipes show you how to bake incredible gluten free desserts with fabulous taste and texture. Create restaurant & bakery caliber desserts at home for your next birthday party, holiday, or dinner event. 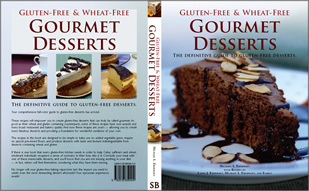 The spectacular and popular Recipes on this website originate from our successful Gluten-Free & Wheat-Free Gourmet Desserts Cookbook. Use these recipes to eliminate gluten from your diet while you enjoy great classic desserts! The simple-to-follow recipes also include pictures showing the finished desserts baked according to each recipe. Full-Color photograph of every freshly-baked delectable dessert recipe — like this Gluten-Free Boston Cream Pie — you see exactly what each recipe produces with such detail you can almost taste it! Our desserts were tested on the entire population (not just Celiacs) for an accurate comparison of our GF desserts to the "real" thing (i.e., not just to GF desserts). Our taste-testers overwhelmingly consider our gluten free desserts bakery / restaurant quality. Our gluten-free Carrot Cake Recipe won FIRST PLACE in cake-baking contest — even against "normal" cakes! No added gums — no Guar, Xanthan, etc. — our gluten free recipes are wonderful without them. Our gluten free recipes address the needs of Celiac and Wheat-Free individuals of all ages (including gluten-free diets for autistic children or kids exhibiting signs of autism). Our recipes are a perfect resource for anyone, even restaurants and businesses, that prepare and serve food to wheat-intolerant or celiac persons or groups! A wonderful collection of glutenfree and wheatfree recipes to bake as-is or to extend with flavorful variations. Even if you do not have Celiac Disease, this is a great way to reduce your gluten intake. Reducing gluten in your diet may offer health benefits such as easier digestion. Carrot Cake Recipe — fabulous!! Chocolate Ganache Cake — a favorite gluten-free birthday cake! Tiramisu — amazing, yet Celiac-safe! Chocolate Layer Cake — another wonderful gluten-free birthday cake! Chocolate Cheesecake — thick, rich, and chocolate galore! Turtle Cheesecake — caramel anyone? Black Forest Bundt Cake — yummy! Cappuccino Cheesecake — coffee/chocolate/etc; fabulous! Chocolate Raspberry Cupcakes — berries and chocolate go so well together. Lemon Angel Food Cake — light and airy and GF too! Standard Pie Crust — for many, many gluten-free and wheat-free pie favorites. Apple Pie — a favorite for many. Peanut Butter Pie — decadent to say the least. Frozen Chocolate Cream Pie — cool and chocolate; what a summer treat. Mocha Tart — Love that chocolate and coffee; now in a fabulous tart. Creme de Menthe Tart — minty refreshment in a dessert. Mini Nut Tarts — awesome! Like mini nut-rolls, but as small tarts. Pecan Pie / Tart — a Southern favorite, as a "tart". Peanut Butter Cookies — the BEST gluten-free PB cookies, EVER! Almond Biscotti — you will not believe these are GF! Italian Lemon Cookies — so good with so many things. Lemon Bars — sweet and tangy lemony zesty delight. Chocolate Orange Macadamia Biscotti — hearty, crunchy biscotti! Lemon Poppy Seed Bread — OMG is this good! Cinnamon Mascarpone Flan — Spanish creamy dessert to die for. Chocolate Pudding — simple and pleasing dessert for all ages; children always love pudding too! Hearty Pearl Tapioca Pudding — not your ordinary tapioca; uses larger "pearl" type; nice variation. Fruit Cup — a healthy gluten-free diet dessert option. Gluten-Free Cream Puffs — beyond believable! Chocolate Covered Strawberries — save a fortune on chocolate-covered strawberries; make your own. AND, a few bonus items like Biscuits and Beer-Battered gluten-free Onion Rings.